This product guide provides essential presales information to understand the ThinkSystem SR950 server, its key features and specifications, components and options, and configuration guidelines. This guide is intended for technical specialists, sales specialists, sales engineers, IT architects, and other IT professionals who want to learn more about the SR950 and consider its use in IT solutions. 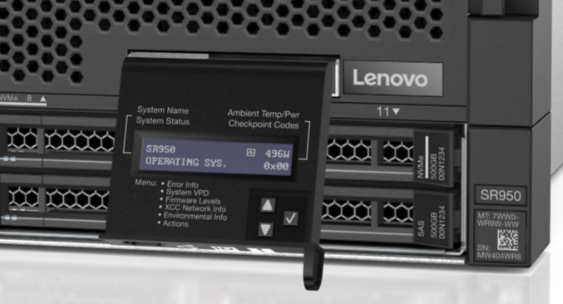 Lenovo ThinkSystem SR950 is designed for your most demanding, mission-critical workloads, such as in-memory databases, large transactional databases, batch and real-time analytics, ERP, CRM, and virtualized server workloads. The powerful 4U ThinkSystem SR950 can grow from two to eight Intel Xeon Scalable Family processors, and with 96 DIMM sockets, supports up to 12 TB of high-speed memory. The modular design of SR950 speeds upgrades and servicing with easy front or rear access to all major subsystems to maximize server availability. The SR950 packs numerous fault-tolerant and high-availability features into a high-density, 4U rack-optimized design that reduces the space needed to support massive network computing operations and simplify servicing. The following figure shows the Lenovo ThinkSystem SR950. The SR950 server supports up to eight processors in a single 4U chassis. You can upgrade from a 2-socket system to an 8-socket system without having to replace the server enclosure or upgrade to a physically larger design. The SR950 offers enterprise scalability and advanced RAS features to support the most demanding mission-critical applications that require 24x7 operations. Lenovo ThinkSystem SR950 is designed for your most demanding, mission-critical workloads, such as in-memory databases, large transactional databases, batch and real-time analytics, ERP, CRM, and virtualized server workloads. The powerful 4U ThinkSystem SR950 can grow from two to eight Intel Xeon Processor Scalable Family CPUs, achieving up to 45% faster performance than the previous generation. The modular design of SR950 speeds upgrades and servicing with easy front and rear access to all major subsystems, to maximize server uptime. Dense server offering where up to 8 processors and 96 DIMMs are housed in only 4U of rack space. Offers a simple upgrade path that enables the server to be initially configured with as few as two processors and then later be upgraded to up to eight processors simply by adding a compute tray and system boards. Supports the Gold and Platinum level processors in the Intel Xeon Processor Scalable Family, including the "top bin" highest-performing 205 W processors available from Intel. Up to eight processors, each with up to 28 cores and 56 threads (for a total of up to 448 threads) to maximize the concurrent execution of multithreaded applications. Intelligent and adaptive system performance with Intel Turbo Boost Technology 2.0 allows processor cores to run at maximum speeds during peak workloads by temporarily exceeding processor TDP. Support for up to 96 TruDDR4 DIMMs operating at 2666 MHz means you have the fastest available memory subsystem and memory capacity of up to 12 TB using 96x 128 GB 3DS RDIMMs. Up to 24x 2.5-inch HDDs or SSDs provide a flexible and scalable all-in-one platform to meet your increasing demands. Of the 24x drive bays, support for up to 12 NVMe PCIe SSDs maximizes drive I/O performance, in terms of throughput, bandwidth, IOPS, and latency. The use of solid-state drives (SSDs) instead of, or along with, mechanical hard disk drives (HDDs), can improve I/O performance. An SSD can support up to 100 times more I/O operations per second (IOPS) than a typical HDD. New high-speed RAID controllers provide 12 Gb SAS connectivity to the drive backplanes. A variety of RAID adapters are available, with cache up to 4 GB and support for 12 drives on a single controller. Supports a new Lenovo-patented M.2 adapter design for convenient operating system boot functions. Available M.2 adapters support either one M.2 drive, or two M.2 drives in a RAID 1 configuration, for the boot drive performance and reliability. The server has a dedicated flexible LAN-on-motherboard (LOM) slot offering a variety of 10 GbE or Gigabit Ethernet adapters that do not occupy one of the standard PCIe slots. 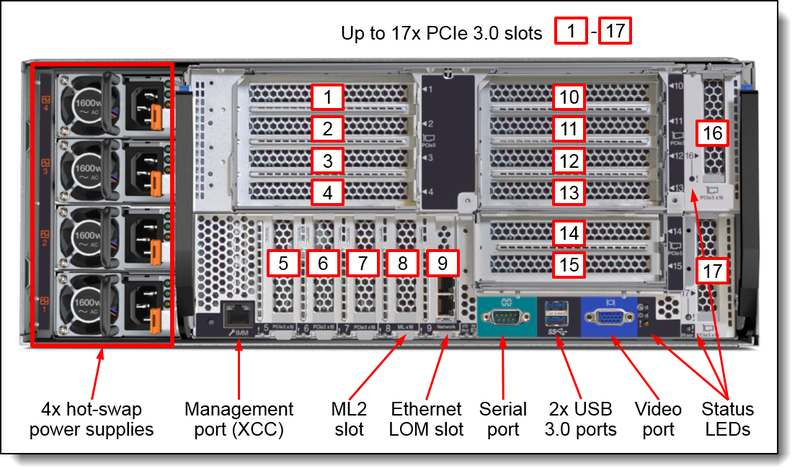 A total of up to 17 rear-accessible PCIe slots: 14 general-purpose PCIe 3.0 slots plus slots dedicated to the LOM adapter and two ML2 adapters. In addition, the server has two internal slots for RAID or HBA adapters. The SR950 is based on a modular service model where all components and options can be removed from the front or rear of the system, even parts that are located in the center of the machine such as fans, memory DIMMs, and processors. The SR950 is designed for 99.99% availability. The Dual M.2 Boot Adapter uses RAID-1 so that the two M.2 drives installed are configured as a redundant pair. The server has up to four hot-swap N+N redundant power supplies to help keep the server operational in the event of a power supply or utility supply failure. Each compute tray has 6 hot-swap N+1 redundant fans (a total of 12 fans when two compute trays are installed) to maximize availability for business-critical applications. The power source-independent light path diagnostics functionality provides individual light path LEDs that lead the technician to failed (or failing) components, which simplifies servicing, speeds up problem resolution, and helps increase system availability. The included LCD system information display panel provides greater diagnostic function by listing all error messages and VPD data needed for a service call, thereby speeding problem resolution and increasing system uptime. Proactive Platform Alerts (including PFA and SMART alerts): Processors, voltage regulators, memory, internal storage (SAS/SATA HDDs and SSDs, NVMe SSDs, M.2 storage, and flash storage adapters), fans, power supplies, RAID controllers, ambient temperature, and subcomponent temperatures. Alerts can be surfaced through the XClarity Controller to managers such as Lenovo XClarity Administrator, VMware vCenter, and Microsoft System Center. These proactive alerts let you take appropriate actions in advance of possible failure, thereby increasing server uptime and application availability. Solid-state drives (SSDs) offer more reliability than mechanical HDDs for greater uptime. Lenovo XClarity Provisioning Manager supports diagnostic functions and collects service data to USB key drive or remote CIFS share folder for troubleshooting, to reduce servicing time. The server includes an XClarity Controller (XCC) to monitor server availability and perform remote management. XCC Enterprise is included as standard, which enables remote KVM and remote media files (ISO and IMG image files), boot capture, and power capping. Lenovo XClarity Administrator offers comprehensive hardware management tools that help to increase uptime, reduce costs, and improve productivity through advanced server management capabilities. Support for Lenovo XClarity Energy Manager which captures real-time power and temperature data from the server, and provides automated controls to lower energy costs. The server can be used in environments up to ASHRAE A4 with ambient temperatures up to 45 °C. The server is Energy Star 2.1 compliant. Intel Intelligent Power Capability powers individual processor elements on and off as needed, to reduce energy draw. Solid-state drives (SSDs) consume as much as 80% less power than mechanical 2.5-inch HDDs. Optional Lenovo XClarity Energy Manager provide advanced data center power notification, analysis, and policy-based management to help achieve lower heat output and reduced cooling needs. The following figure shows the front of the SR950 server. The following figure shows the rear of the SR950 server. The server has up to 17 PCIe slots, depending on the riser cards selected, and the number of processors installed. The processors and other components are located on compute trays, the Upper Compute Tray and the Lower Compute Tray. Each compute tray holds up to four processors on two system boards. The compute trays are accessible from the front of the server, as shown in the following figure. The following figure shows the rear of the compute tray with its two compute system boards, one of them removed. The compute system board is shown in the following figure. Each system board holds two processors and 24 DIMM sockets, 12 per processor. The system board also has connections for the NVMe ports used to connect to the PCIe NVMe drive bays at the front of the server. Processors installed in the compute system boards are numbered as shown in the following figure. For some four-socket storage-rich configurations, a storage tray is used in the upper tray area instead of a compute tray. 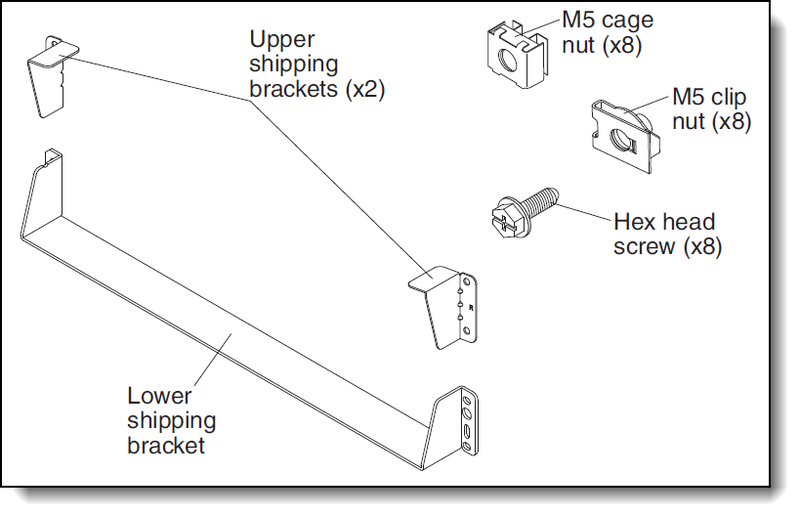 The following figure shows the key components of the storage tray. All slots and ports at the rear of the server are housed in the I/O tray as shown in the following figure. The following figure shows the architecture of the SR950 at a high level. The system boards with processors and memory are installed in compute trays along with the drive bays and storage adapter. 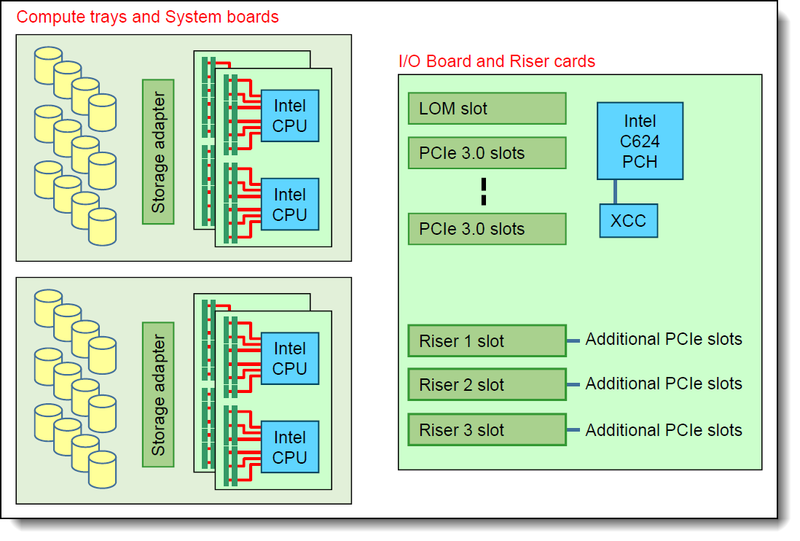 The I/O board houses all onboard PCIe slots as well as the slots for the riser cards the offer the remaining PCIe slots. The specific connections between system boards, processors and PCIe slots are dependent on the server configuration. This is described in detail in the Server configurations section. Specific processor-slot connections based on each configuration are described in the Slot availability by server configuration section. The following figure shows System board 1 where processors 1 and 2 are installed. The slots on the I/O board are connected directly to these processor (or indirectly through the Intel C624 Platform Controller Hub, PCH). The processors within the chassis communicate via UltraPath Interconnect (UPI) ports. These ports allow high speed communication between the CPUs. UPI replaces the Intel QuickPath Interconnect (QPI). 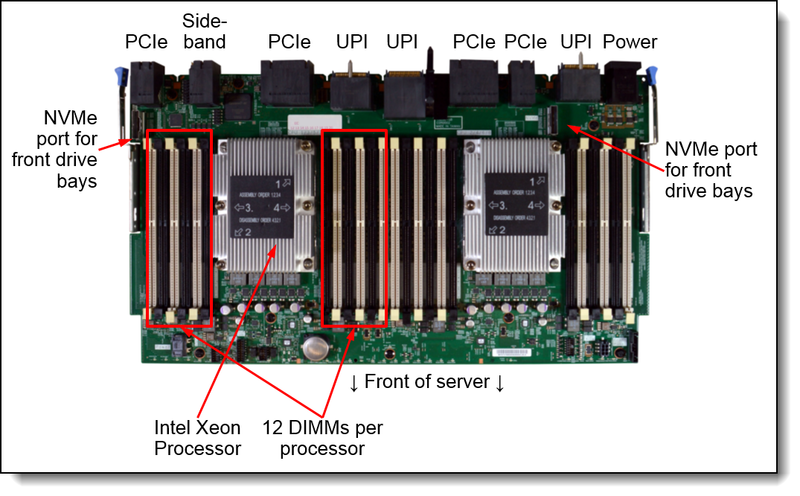 One UPI link connects the two processors on each system board (UPI 3) and the other two UPI links are used to connect the other processors in adjacent boards to form four-way and larger systems. In four-processor configurations, the design of the UPI links is either in a mesh or a ring topology. When a processor has 3 UPI ports, it can be used in a 4-socket mesh configuration where all processors are directly connected to every other processor. 5100 Series processors only have 2 UPI ports (ports 1 and 2) and therefore do not support mesh topology. These two UPI configurations are shown in the following figure. Ring topology with 8100 Series processors: As discussed in the Server configurations section, the “Four-Socket Upgradable / Storage Rich” configuration is a four-socket configuration that uses a Ring topology but uses 8100 Series processors. The server supports an 8-socket configuration (8100 Series processors required). The following figure shows the UPI links used to connect eight processors. Refer to the processor options table for information on the number UPI links each processor option has for the SR950 system. The SR950 supports five different configurations, depending on the desired number of processors, drive bays, PCIe slots, and upgradability to an 8-socket configuration. The configurations listed here represent Lenovo's recommendations regarding the selection of compute system boards, I/O riser cards, and NVMe drive bays to maximize the available resources. 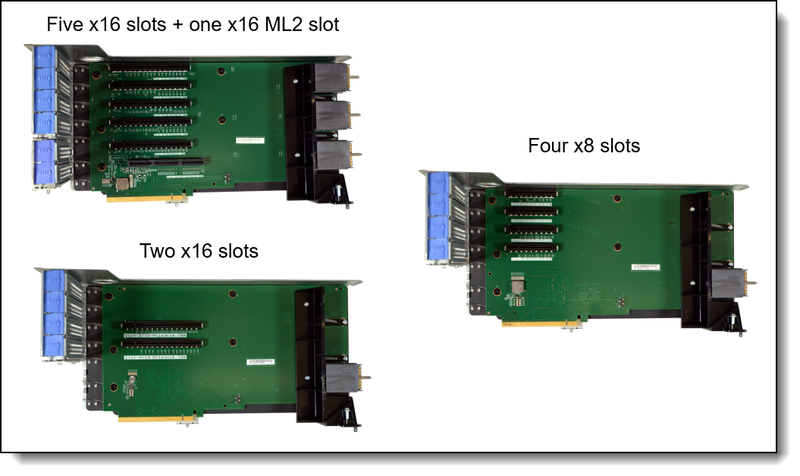 You can select fewer drives and lower slot counts by using lower-slot-count riser cards to meet application requirements. The use of only two, three or six processors in configurations where supported will reduce the available I/O slots and NVMe drive bays. This is described in details in the Internal storage section and the I/O expansion options section. Configurations 1 and 2 support either two, three or four processors, however the use 5100 Series processors requires that four processors be selected. 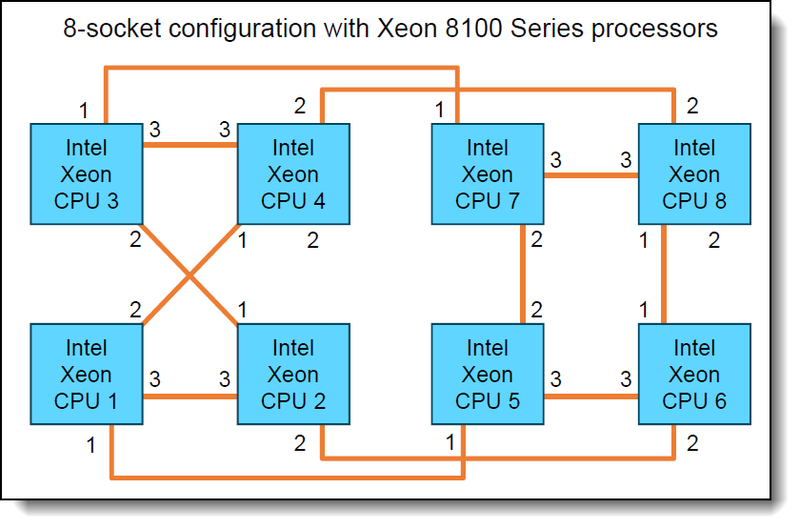 Two or three 5100 Series processors are not supported in these configurations due to the way the processors are connected. Configurations 3 and 4 are designed to be easily upgradable to 8 processors. As a result, 8100 Series processors are required. When building a server in the configurator, the feature codes in the following table are key to selecting the right configuration. Upgrades: Configurations 1-4 can be upgraded to an 8-socket configuration (Configuration 5) as described in the Server configuration upgrades section. The highest-performing 4-socket server, at the lowest cost, when up to 12 drives is enough, and without the need for a simple upgrade. Supports 2, 3 or 4 processors (if using 5100 Series processors, 4 processors must be selected). 4 sockets configured in mesh topology for best performance. 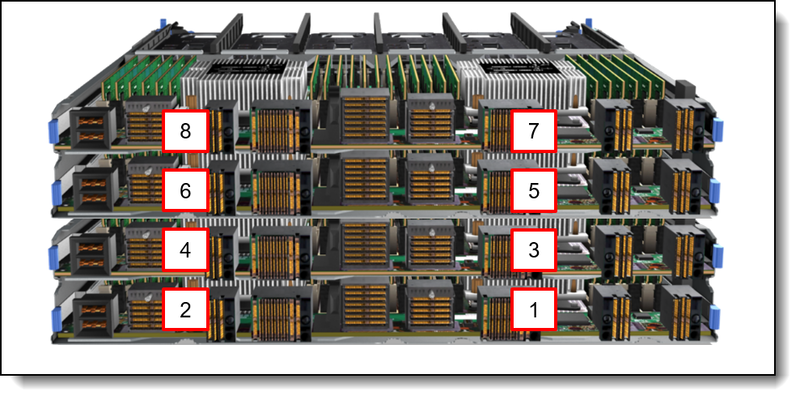 12 drive bays, 6 of which support NVMe drives (4 NVMe with 3 processors, and 2 NVMe with 2 processors). 15 rear PCIe slots with 4 processors (10 rear slots with 3 processors, and 6 rear slots with 2 processors). Filler installed in the upper tray area. Can be upgraded to 8S but requires the 4S Performance to 8S Upgrade Kit, additional components, and Lenovo hardware installation. Select feature codes AUNY and AX3Y. The highest-performing 4-socket server, when needing more than 12 drives without the need for a simple upgrade. 4 processors configured in mesh topology for best performance. 24 drives, 12 of which support NVMe drives (8 NVMe with 3 processors, and 4 NVMe with 2 processors). 13 rear PCIe slots with 4 processors (9 rear slots with 3 processors, and 5 rear slots with 2 processors). Storage tray installed in the upper tray area. Select feature codes AUNY and AX3Z. The lowest-cost 4-socket server capable of a simple upgrade to 8 socket, and when 12 drive bays with 4 processors is enough storage. 2 or 4 processors, must be 8100 Series processors. 4 processors in a ring topology. 12 drive bays including up to 6 NVMe (2 NVMe with 2 processors). Up to 15 rear PCIe slots with 4 processors (6 rear slots with 2 processors). Upgradable to 8-socket with an additional compute tray and two system boards. Once upgraded, the system will have 24 drive bays. Select feature codes AUKF and AX3Y. 4-socket server capable of a simple upgrade to 8-socket, and needing more than 12 drive bays with 4 processors. Requires 4 processors, must be 8100 Series. 24 drive bays (including up to 4 NVMe). Two compute trays, with one system board in each tray. Upgradable to 8-socket with two additional system boards. Once upgraded, the server will support 12 NVMe drives. Select feature codes AUKF and AX3Z. Full featured 6- or 8-socket server with up to 24 drive bays, and the maximum number of PCIe x16 slots. Requires 6 or 8 processors, must be 8100 Series. 24 drive bays, 12 of which support NVMe drives (8 NVMe with 6 processors). 17 rear PCIe slots (13 rear slots with 6 processors installed). Two compute trays each with two system boards. The following table summarizes the configurations. † If using 5100 Series processors, then 4 processors must be selected. Using two 5100 Series processors is not supported. * Mesh topology requires a processor with 3 UPI connections; Processors such as the 5100 series with only 2 UPI connections will operate in Ring topology. See the table in the Processor options section. ‡ Upgrade requires the ThinkSystem SR950 4S Performance to 8S Upgrade Kit, 4TA7A10969. See the Server configuration upgrades section below. For details about PCIe slot availability based on each server configuration, see Slot availability by server configuration. This section describes the system upgrades you can perform in the field. The upgrades are based on the configurations that are described in the Server configurations section. Key components in the upgrades are listed in the following table. The following table describes the before and after configurations and the components you will need to order to achieve the desired configuration. The added processors must match the processors already installed. When upgrading to Configuration 5 (8-socket configuration), Platinum-level (81xx) processors must be used, as listed in the Processor options section. Gold processors do not support 8-socket configurations. The ThinkSystem SR950 4S Performance to 8S Upgrade Kit, 4TA7A10969, contains the mid-chassis interconnects needed for an 8-socket configuration, replacing the existing interconnects. Lenovo installation is highly recommended due to the complexity of this upgrade. Installation cost will vary depending on location and scope of work. Up to eight Intel Xeon Processor Scalable Family of processors, either Gold or Platinum level processors (formerly codename "Skylake"). Supports processors with up to 28 cores, core speeds up to 3.6 GHz, and TDP ratings up to 205W. Processors and memory are located on system boards installed in compute trays: 2 processors per system board, 2 system boards per compute tray, and 2 compute trays in the server. Note: Support of more than 768 GB per processor (more than 3 TB for a 4-processor system or 6 TB for an 8-processor system) requires M-suffix processors with 1.5 TB memory support. See the Processor options section for information. Disk drive bays Up to 24x 2.5" hot-swap SAS/SATA drive bays. 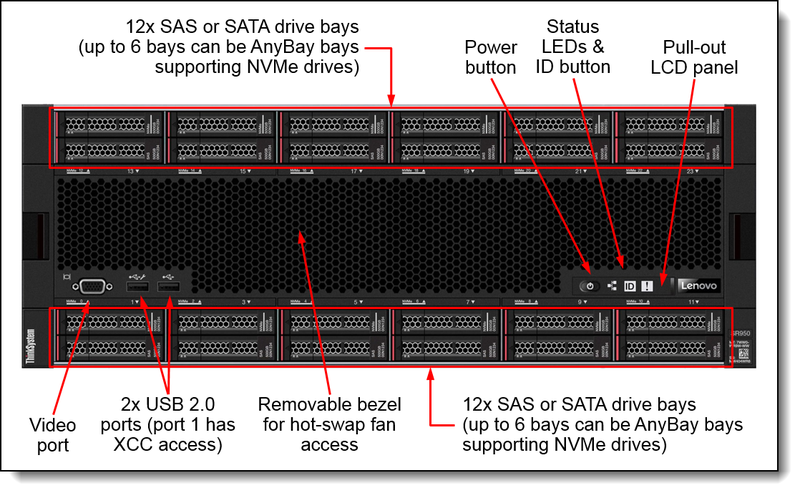 With AnyBay backplanes, 12 bays can be configured to support PCIe NVMe drives. Optical and tape bays No internal bays. Network interfaces Integrated 10Gb Ethernet controller, based on the Intel Ethernet Connection X722. The server supports 1 of 6 available LOM adapters, providing either 2- or 4-port Gigabit Ethernet, 2- or 4-port 10 GbE with SFP+ connections or 2- or 4-port 10 GbE with RJ45 connections. One port can optionally be shared with the XClarity Controller (XCC) management processor for Wake-on-LAN and NC-SI support. 1 or 2 ML2 adapter slots for additional network adapters. Ports Front: Two USB 2.0 ports (one also for XCC local management), and one VGA video port. Rear: Two USB 3.0, one VGA video, one DB-9 serial, and one 1 GbE RJ-45 systems management. The serial port can be shared with the XCC for serial redirection functions. Only one VGA port can be used at a time. Cooling Up to 12 redundant hot-swap single-rotor fans, 6 in each compute tray. Each tray has N+1 fan redundancy. Power supply Up to four redundant hot-swap 1100 W or 1600 W power supplies (80 PLUS Platinum certified), supporting 200-240 V AC input. The 1100 W power supply also supports 100-127V AC input supply with a reduced capacity of 1050 W. No support for 240 V DC. Hot-swap parts Drives, power supplies, and fans. Security features Power-on password, administrator's password, Trusted Platform Module (TPM), supporting TPM 1.2 or TPM 2.0. In China only, optional Trusted Cryptographic Module (TCM). Systems management XClarity Controller embedded management, XClarity Administrator centralized infrastructure delivery, XClarity Integrator plugins, and XClarity Energy Manager centralized server power management. XClarity Controller Enterprise functionality standard with the SR950. Light path diagnostics for local failure detection and reporting, with LCD diagnostic pull-out panel. Limited warranty One year or three-year (model dependent) customer-replaceable unit (CRU) and onsite limited warranty with 9x5 next business day (NBD). Dimensions Height: 173 mm (6.8 in. ); Depth (EIA flange to rear): 800 mm (31.5 in. ); Depth (overall): 835 mm (32.9 in. ); Width (across top cover): 447 mm (17.6 in. ), Width (to EIA flanges): 482 mm (19.0 in.). All models include a rail kit. The Lenovo SR950 solutions for SAP HANA provide optimal solutions for SAP BW/4HANA and SAP S/4HANA applications. The following table lists the configurations available for SAP HANA (machine type 7X13). System upgrades to 8 sockets: SAP HANA configurations described here can be upgraded to 4 or 8 sockets as described in the Server configuration upgrades section. Refer to the Configuration 1 and Configuration 2 rows in the table. Each configuration listed in the table uses either the Platinum 8176 or 8176M processors, depending on the amount of memory installed. The Platinum 8180 and 8180M can also be used if greater performance is desired. An M-suffix processor is required for 8-socket configurations with 12TB of memory, for 4-socket configurations with 6TB of memory, or for 2-socket configurations with 3TB of memory. In addition to the configurations listed in the SAP HANA configurations section, Lenovo also offers predefined models available to customers in certain countries. The following tables list the available models, grouped by region. Tip: The models in the tables below are sorted by total memory capacity. For configurations that support up to eight processors, the server supports 2, 4, 6 or 8 processors. For configurations of up to four processors (lower cost configuration, no upgrade path to eight processors), the server supports 2, 3 or 4 processors. As described in the Components and connectors section, processors and memory are located on compute system boards - two processors per board. Two system boards are installed in a compute tray, and there are two compute trays in the server. For configurations with only one compute tray, you can upgrade to add a second compute tray. You can also add additional system boards as needed. The ordering information for these upgrades is listed in the following table. The table below lists the supported processors. The table indicates which processors support 8-socket configurations and whether the processors support memory capacities greater than 768 GB per processor. The table also lists the number of Intel Ultra Path Interconnect (UPI) ports each processor has. UPI ports are used to connect processors together for high-speed communications. When a processor has 3 UPI ports, it can be used in a 4-socket mesh configuration where all processors are directly connected to every other processor. 5100 Series processors do not support mesh topology, since they only have 2 UPI ports. When a processor has only 2 UPI ports, it can only be used in a 4-socket ring configuration where all processors are connected to the 2 adjacent processors and the fourth processor is only connected indirectly via another processor. The mesh and ring topologies are shown in the following figure. The SR950 uses Lenovo TruDDR4 memory operating at up to 2666 MHz. The server supports 12 DIMMs per processor, which corresponds to 48 DIMMs with four processors installed and 96 DIMMs when eight processors are installed. Each processor has six memory channels with two DIMMs per channel. With 128 GB 3DS RDIMMs installed, an 8-socket server supports a total of 12 TB of system memory. As described in the Components and connectors section, the memory is installed on compute system boards and there are two system boards per compute tray and one or two compute trays per server, depending on the configuration. All DIMMs operate at a speed of 2666 MHz, both at 1 DIMM per channel and 2 DIMMs per channel. However, if the processor selected has a lower memory bus speed (for example 2400 MHz), then all DIMMs will operate at that lower speed. The following table lists the memory options that are available for SR950. Lenovo TruDDR4 memory uses the highest quality components that are sourced from Tier 1 DRAM suppliers and only memory that meets the strict requirements of Lenovo is selected. It is compatibility tested and tuned to maximize performance and reliability. From a service and support standpoint, Lenovo TruDDR4 memory automatically assumes the system warranty, and Lenovo provides service and support worldwide. Populate memory DIMMs in quantities of 6 or 12 per processor, so that all memory channels are used. When mixing 16 GB and 32 GB DIMMs in the same configuration, use 16GB 2Rx8 DIMMs instead of 16 GB 1Rx4 DIMMs for better performance. Populate memory channels so they all have the same total memory capacity. Ensure all memory controllers on a processor socket have the same DIMM configuration. All processor sockets on the same physical server should have the same DIMM configuration. If memory channel mirroring is used, then DIMMs must be installed in pairs or sets of three (minimum of one pair or set of three per processor), and all DIMMs in the pair or set of three must be identical in type and size. 50% of the installed capacity is available to the operating system. If memory rank sparing is used, then a minimum of two single-rank or dual-rank DIMMs must be installed per populated channel (the DIMMs do not need to be identical). In rank sparing mode, one rank of a DIMM in each populated channel is reserved as spare memory. The largest rank in the channel will be automatically selected as the spare rank. The amount of memory available to the operating system depends on the number, capacity and rank counts of the DIMMs installed. The SR950 offers up to 24x 2.5-inch drive bays, depending on the server configuration selected (as described in Server configurations). The server also supports either one or two M.2 drives, installed in an M.2 adapter. Drives are all located at the front of the server, 12 drives at the front of the upper tray and 12 at the front of the lower tray. Drives are connected to 4-drive backplanes in a 2-by-2 configuration, as shown in the following figure. All drive bays are 2.5-inch form factor. Regular 2.5-inch SAS/SATA drive bays support only SAS or SATA drives; however, the Lenovo AnyBay drive bay design allows a choice of SATA, SAS, or U.2 (NVMe) PCIe drives. 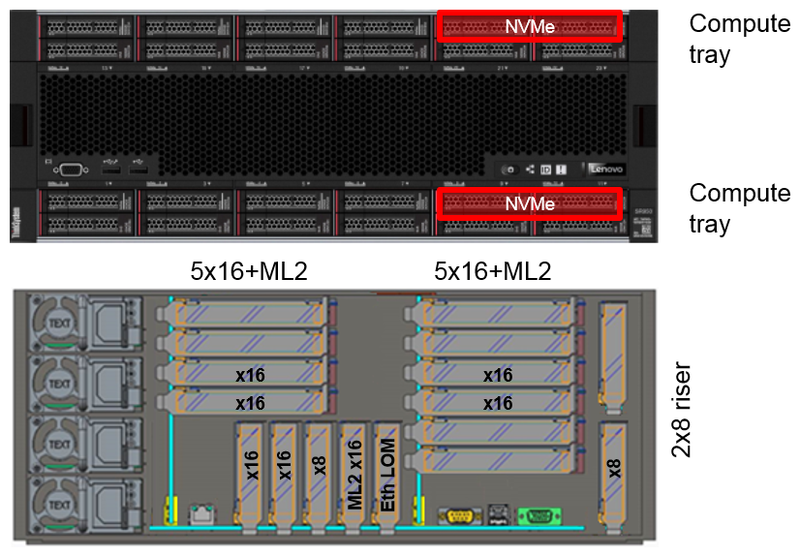 This design enables the flexibility to configure some of the bays with high-performance PCIe SSDs while still using the other bays for high-capacity HDDs, which is an ideal solution for storage-tiering. If the server is configured with all AnyBay backplanes, then the server supports up to 12 NVMe drives, depending on the server configuration. 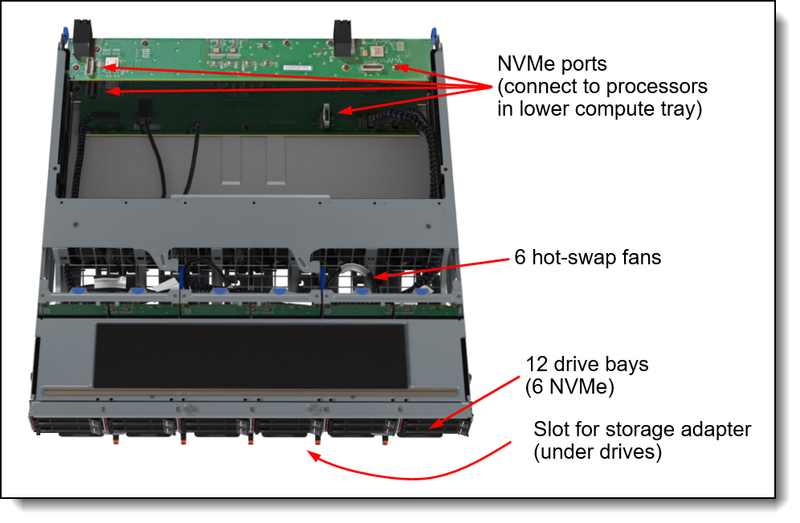 The NVMe-capable drive bays are the even-numbered bays as shown in the following figure. The quantity and location of the AnyBay drive bays depends on the configuration, as listed in the following table. See the Server configurations section for details about the five server configurations. 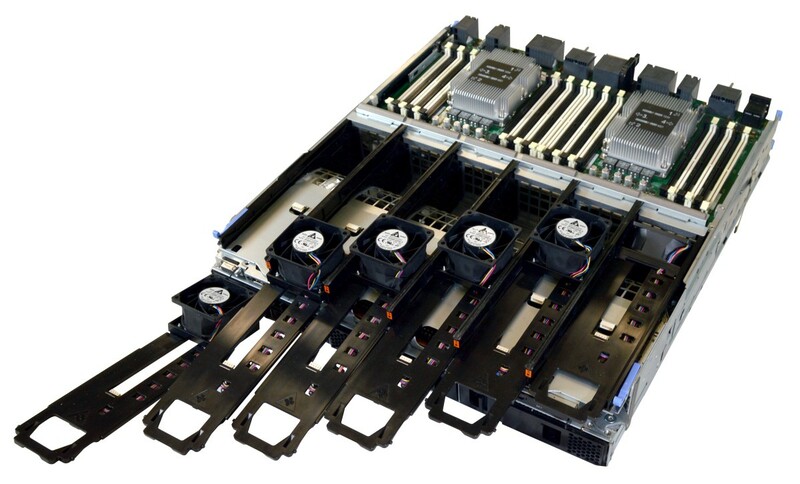 The 4-drive SAS/SATA backplane has one SAS/SATA connector and connects to a supported RAID controller or SAS HBA installed in the dedicated storage adapter slot. 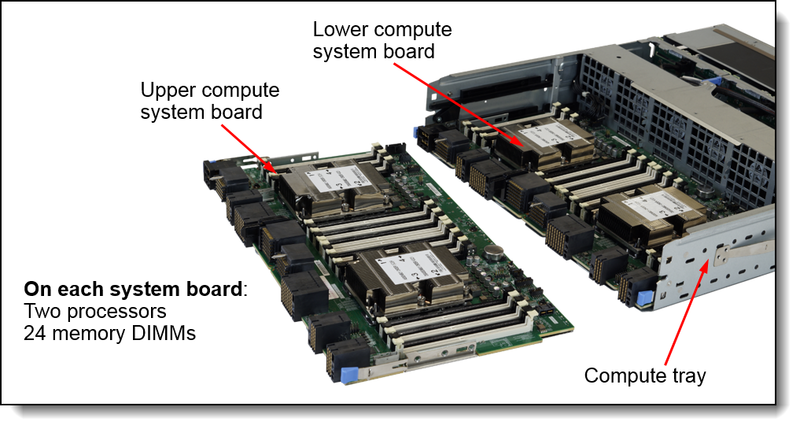 The 4-drive AnyBay backplane has one SAS/SATA connector and connects to a supported RAID controller or SAS HBA plus one NVMe connector to connect to NVMe ports on one of the system boards in a compute tray or directly on the storage tray. The SAS/SATA backplane is shown in the following figure. Each compute tray or storage tray includes one dedicated PCIe slot for a RAID adapter or SAS HBA. SAS/SATA backplanes are connected to the RAID adapter or HBA installed in the dedicated slot in that tray. AnyBay backplanes (NVMe support on 2 of the 4 drive bays) are connected to the RAID adapter or HBA or to an NVMe port adjacent to processor on a system board. The following table lists which processor each SAS/SATA storage adapter and which NVMe port each backplane is connected to. Backplane numbering is shown in Figure 11. Processor numbering is shown in Figure 7. In 2-processor configurations, processors 3 and 4 are not installed; this means drive backplanes 1 and 2 cannot be AnyBay backplanes. The SR950 supports internal SAS and SATA drives with the addition of a RAID adapter or HBA. The adapter is installed in a dedicated slot in each compute tray. For NVMe support, the server uses NVMe ports that are on the compute system boards or on the storage tray if one is configured. † The RAID 730-8i 1GB Cache adapter is not available in USA and Canada. * SED (self-encrypting drive) support of the SAS HBAs is by using software on the server (SED commands are passed through the HBA to the drives). SED support by RAID controllers is provided using the built-in MegaRAID SafeStore functionality of the adapter. ** With the SR950, the 430-16i HBA and RAID 930-16i support up to 12 drives. The server does not support any internal backup units. 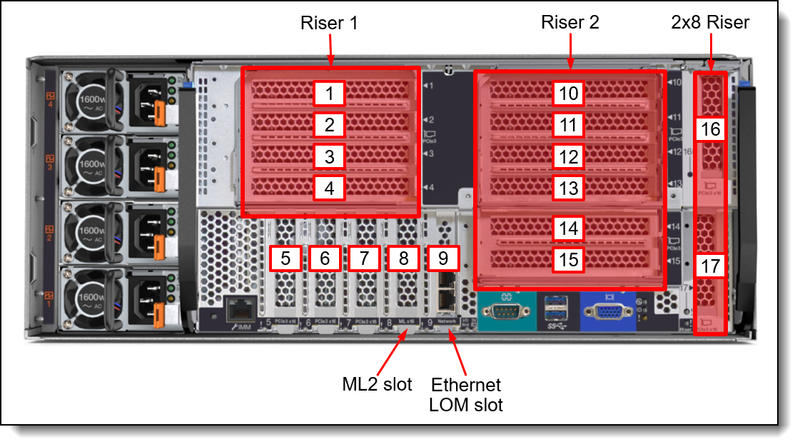 The following figure shows the locations of the slots at the rear of the server. NC-SI (Network Controller Sideband Interface or NCSI) support means the primary port on the adapter installed in that slot can be configured as shared between XCC out-of-band management traffic and production Ethernet traffic. For riser slots 1 and 2, the server supports the following three riser cards. These are shown in the figure below. Note: When the 5x16+ML2 riser is installed in riser slot 1, the bottom two slots (including the ML2) are not accessible and cannot be used. Note: The ML2 slot on the riser card does not support NC-SI. Note: When the 5x16+ML2 riser card is used in Riser slot 1, only the top 4 slots (all x16) are accessible. The lower x16 and x16 ML2 slots cannot physically be accessed or used. 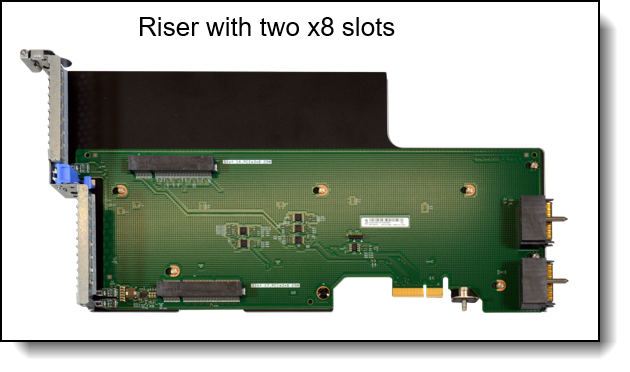 The 2x8 riser card is shown below. Ordering information for the riser cards is listed in the following table. The riser cards required for each server configuration are listed in the following table. See the Server configurations section for details. Based on these riser card requirements, the available slots for each server configuration are highlighted with a grey background in the following table. The table also lists the processor that each PCIe slot is connected to, based on the server configuration selected. In the table, NC means not connected. 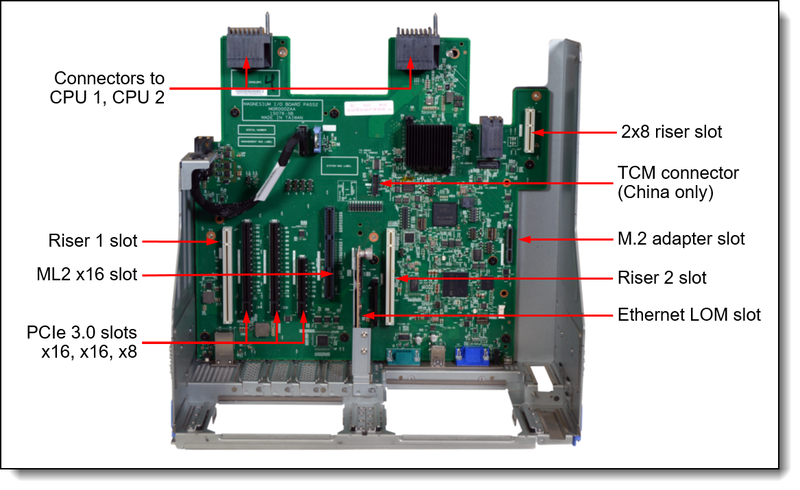 To provide connectivity to the X722, the SR950 supports six different LOM (LAN on Motherboard) cards which provide the Ethernet PHY function. Only 1 LOM card can be installed. See Figure 3 for the location of the LOM slot. The LOM card supports NC-SI to allow the network connection to be shared between the operating system and the XClarity Controller (XCC) management module. The LOM also supports Wake-on-LAN (WOL). The SR950 also support one ML2 card for 4-socket configurations (slot 8). For 8-socket servers using the 5x16 ML2 riser, the server has two ML2 slots - slot 8 and slot 15. See the I/O expansion options section for details. The ML2 card in slot 8 supports NC-SI however the ML2 card in slot 15 does not support NC-SI. The following table lists the supported ML2 adapters. * ThinkSystem servers do not support Features on Demand, so the Emulex VFA5.2 ML2 Dual Port 10GbE SFP+ Adapter, 00AG560, cannot be upgraded to FCoE support. If you need FCoE or iSCSI support, use 01CV770 instead. † Two ML2 adapters are supported with an 8-socket configuration if the 5x16+ML2 riser is installed in riser slot 2. * ThinkSystem servers do not support Features on Demand, so the Emulex VFA5.2 2x10 GbE SFP+ PCIe Adapter, 00AG570, cannot be upgraded to FCoE support. If you need FCoE or iSCSI support, use 00AG580 instead. The following table lists the Fibre Channel HBAs supported by SR950. The following table lists SAS HBAs and RAID adapters supported by SR950 server for use with external storage. * Maximum is 4 adapters because there are only 4 supercap holders in the server, mounted on the side of the two riser cards. * SED support of the SAS HBAs is by using software on the server (SED commands are passed through the HBA to the drives). SED support by RAID controllers is provided using the built-in MegaRAID SafeStore functionality of the adapter. Full-length adapter cards such as graphics processing units (GPUs) do not physically fit in the server and are not supported. The SR950 uses a set of 60mm hot-swap single-rotor fans for system-wide cooling. Each compute tray or storage tray houses 6 hot-swap fans. The 6 fans in the compute tray are N+1 redundant, meaning that a single fan failure is tolerated in each compute tray. Fans are located internal to the server immediately in front of the compute system boards, but are accessible from the front of the server by the long handle attached to the fan. As the handle is pulled out, the attached fan rotates from vertical orientation to horizontal orientation, allowing the fan to be removed from the system using the handle, as shown below. The server supports up to four hot-swap power supplies. Power supplies are N+N redundant, which means that if the server has four power supplies installed, then the server can continue operation even with two failed power supplies, or if the utility service that feeds those two power supplies goes offline. All power supplies installed in a server must have the same capacity (for example all 1600W). The 1100W power supply is auto-sensing and supports both 110V AC (100-127V 50/60 Hz) and 220V AC (200-240V 50/60 Hz) power. The 1600 W power supply only supports 220V AC power. 240V DC is not supported. Note: At 100-127 V AC input, the 1100W power supply is limited to 1050W. Power supply options do not include a power cord. For models of the SR950, the inclusion of a power cords is model dependent. Configure-to-order models can be configured without a power cord if desired. The SR950 offers the front operator panel showing key LED status indicators, as shown in the following figure. The front operator panel pulls out (see the release latch in the above figure) to show an LCD display panel and buttons, as shown in the following figure. The LCD display panel allows quick access to system status, firmware, network, and health information. For local console use, the SR950 has both a front and rear VGA port. Only one can be active at a time. If displays are connected to both VGA ports, the front VGA port takes precedence. Web browser - HTML 5-based browser interface with NLS support and using a responsive design that is suitable for all devices. Java and ActiveX are not required. A virtual presence (remote control and remote media) capability also comes standard in the server for remote server management. The plugin TCM and NationZ TPM modules, available only for China customers, are installed in a dedicated socket on the I/O tray, as shown in Figure 9. Ordering information is shown in the following table. 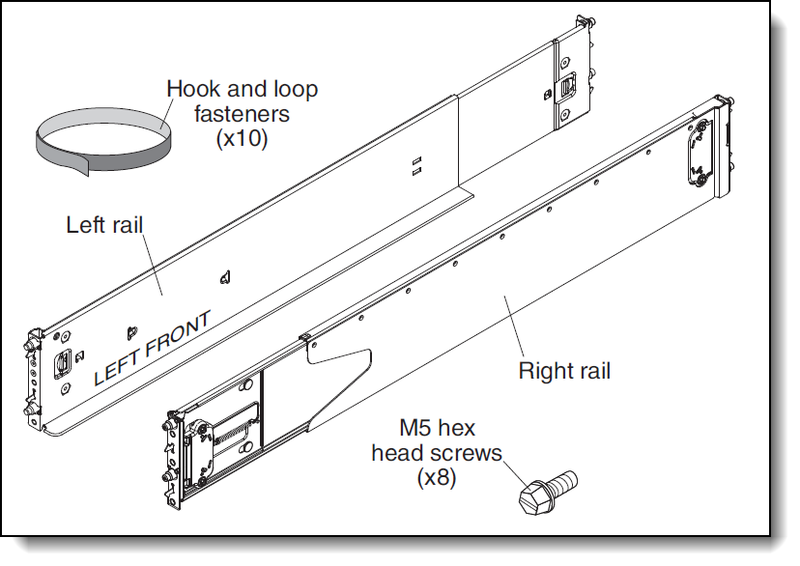 All models of the SR950 include a rail kit for installation in a 19-inch rack cabinet. The contents of the kits are shown in the following figure. Optionally available is the SR950 shipping bracket kit, which is used when the server is installed in a rack and the complete rack is then shipped to the client. Note: Support for RHEL 6.9 on the SR950 is limited to up to 4 processors. Configurations greater than 4 processors are not supported. The ThinkSystem SR950 server is designed to ensure thermal compliance to ASHRAE A4 ambient environments, however certain processor models and other components will limit support to only ASHRAE A2 conditions, as shown in the following table. Further, some high-end processors (as indicated with an * in the table) when used in an eight-socket configuration may experience a slight drop in performance under extreme workloads when the ambient temperature is above 30°C. * These processors when used in an eight-socket configuration may experience a slight drop in performance under extreme workloads when the ambient temperature is above 30°C. ActiveX®, Microsoft®, SQL Server®, Windows Server®, and Windows® are trademarks of Microsoft Corporation in the United States, other countries, or both.